The Carousel was different from the usual carousel in that it had two levels. The usual things were on the carousel, such as cars, bikes and fire trucks, and the ride gave a very traditional look to Cred Street. This ride was aimed at the younger visitors. 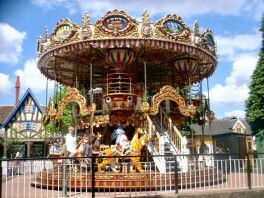 The Carousel was removed along with the Vintage Cars at the end of 2005, to allow space for the Driving School.